Photographs displayed under cross-examination by Credit Czar David Howe evoke ‘not to be believed’ testimony from EHI Management perfect for ‘WOW-WORTHY’ BION! ORLANDO, FLORIDA, UNITED STATES OF AMERICA, October 6, 2018 /EINPresswire.com/ — SubscriberWise, the nation’s largest issuing CRA for the communications industry and the leading protector of children victimized by identity fraud, announced today the BION (https://www.ripleys.com/submit-bions/) submission from two photographs that were the subject of testimony in Howe vs. Enterprise Holdings dba National Car Rental. 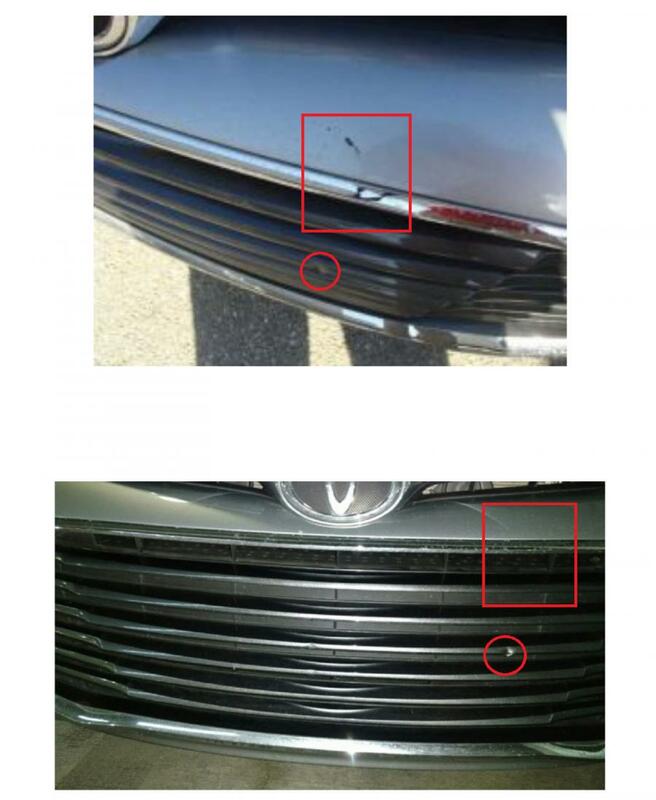 The specific ‘Believe It or Not!’ question for Ripley’s audience is simple: ‘Believe It or Not!’ as to whether the two photographs, in fact, reveal the same vehicle condition. In other words, ‘believe it or not’ but Enterprise Holdings’ National Car Rental would have Judge Hayward and the citizens of the world ‘Believe It!” that what you don’t see on the bottom photo in terms of the ‘cracked’ trim-line and the ‘scratch’ just above and to the left of the ‘ding’ on the top photo…well according to EHI management and attorneys — that same damage is merely concealed by the ‘angle’ of the camera. According to Enterprise, ‘Believe It’, because they’ll have the world believe that the top and the bottom photo show the same condition as evidenced by the agency’s under-oath testimony. The ‘small claim’ hearing with the truly ‘NOT!’ believable SWORN testimony from EHI attorneys and company was held in the Circuit/County Court of the Twentieth Judicial Circuit in and for Lee County, Florida. “I must confess that the idea to submit the courtroom photographs as a ‘BION’ was not spontaneous,” confirmed David Howe, SubscriberWise founder, USA Credit Czar, National Child Identity Guardian, and Enterprise Holdings fraud victim and survivor. “Rather it came from the litany of words used to describe the disbelieve from every single person who saw the evidence and read the testimony from EHI management. “In fact, even a participant-observer from Judge Hayward’s courtroom contacted me to express their ‘surprise and ‘disbelief’ at what was heard and witnessed in that courtroom. Sadly for truth and justice, none of the testimony or exhibits were under the careful review, consideration, and scrutiny of a ‘Jury of Peers’. That's all by design, for the record, to keep juries far from courtrooms where fraud and predatory behavior are concealed through perjury and lies. No doubt that it's also regrettable that there’s no video from the courtroom for the rest of the world inhabitants to see and hear the testimony as it played out in Lee County, FL. “For example, words I heard repeatedly: ‘really’, ‘shocking’, ‘pathetic’, ‘WOW’, ‘seriously,’ ‘remarkable’, ‘unbelievable’, ‘contemptuous’, ‘cover-up’, ‘conceal’, and on and on and on. And those were the kind descriptions. As anyone with a shred of common-sense and honesty would imagine and understand, there are far more abrasive adjectives and descriptions unsuitable for print,” Howe continued. “So, I wondered, is there anyone outside of the car rental industry who might actually ‘Believe It’ since all others concluded ‘NOT’? “And that’s how the idea for a submission to Ripley’s ‘Believe It or Not!’ came into being,” added Howe. “Of course, if anyone is wondering whether this ‘cover-up’ courtroom testimony adds a mountain of credibility as it relates to Enterprise Holdings’ National, Alamo, and Enterprise Car Rental denying the renting public due-process of law with a ‘Jury of Peers’ through predatory adhesion contracts, then wonder no more. On that score, the ‘Believe It!’ column wins hands down, each and every time,” Howe concluded. 18 MR. CITRON: Just a couple. 21 Q Tim, do you believe that this picture Mr.
23 totality of the car? 3 Exhibit 7, they're from different angles? 6 the totality of the car? Car rental scam — TELL THE FTC!